Flexible metering solutions ideal for new or retrofit installations. Monitor anything from a single phase circuit to an entire building depending on your application requirements.The Contractor�s Choice For Metering for 25+ years. Quick and easy installation using E-Mon�s patented 0-2 Volt output split-core current sensors. Onboard installation diagnostics & verification system. Built-in RS-485 communications capability supports up to 52 Class 3200, 3400, 5000 meters and/or IDR interval recorders(or combinations not to exceed 52 devices per channel). Cabling can be either daisy-chain or star configuration, 3-conductor, 18-22 AWG, up to 4,000 feet cable total per channel. Records kWh and kVARh delivered, kWh and kVARh received in first 4 channels. Data stored in 15-minute intervals for up to 72 days or 5-minute intervals for up to 24 days. Maintains interval data storage in a first-in, first-out format. Compatible with E-Mon Energy software via EZ7 protocol for automatic meter reading, billing and profiling of interval energy data. Meter is designed for use on both 3-phase, 3-wire (delta) and 3-phase, 4-wire (wye) circuits. Industrial grade green JIC steel enclosure with padlocking hasp and mounting flanges for indoor installation (stand alone). Knockouts: 1 1/16″ (3/4″ cond.) on bottom and 7/8″ (1/2″ cond.) on top of enclosure. Optional outdoor NEMA 4X polycarbonate enclosure (standard) with padlocking hasp & mounting flanges for indoor/outdoor installation (stand alone) with one 1 1/16″ KO on bottom of enclosure. UL/CUL Listed. Certified by independent test lab to ANSI C12.20 national accuracy standards. (+/- 0.2% from 1% to 100% of rated load.) MV-90 Compatible (EZ7 only). Meters supplied standard in NEMA 4X outdoor enclosures. 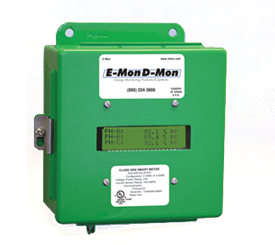 To order a different enclosure replace �R� in model number with optional enclosure specification. Specify protocol package when ordering all meters. Replace * in model number with protocol package specification below.